Bus routes connect all UNL campuses, Monday through Friday, when classes are in session. The maps provide all routes and stop sites. 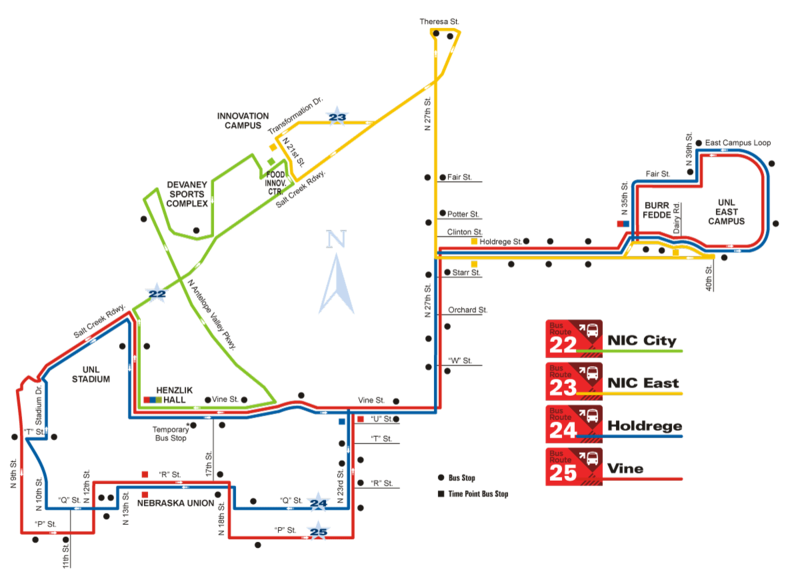 To ride, be ready to show your NCard and your bus pass. Passes are available at no cost for students, and for faculty and staff who purchase parking permits at Parking and Transit Services. An interactive map can be viewed online from your mobile device or desktop using the link below. This interactive map allows you to easily view real-time GPS location of buses. Be sure to bookmark the page on your mobile device for easy viewing. You may also use this map to look up bicycle parking, accessible parking, visitors parking, and building locations. StarTran website also lists a number of bus-tracking mobile apps that you can install on your mobile device. These apps may consume data and are developed by private entities.